Throughout August, over 50 young people from the National Citizen Service gave up their summer holiday to help us engage with and raise money in the local community. 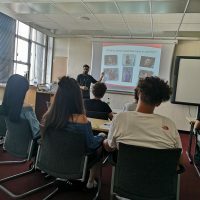 NCS is a fantastic Government backed scheme encouraging 15-17 year olds to give something back during their summer holiday by designing and executing community projects for local causes. Participating in the project aims to provide them with practical life skills including budgeting, organisation and working as a team as well as providing them with a sense of community. We welcomed each of the 5 cohorts to St Mark’s Hospital where they spent the day learning about the Hospital, the Foundation and Bowel Cancer Screening. The young people were really receptive, keen to find out more and were proactive in participating in activities and presentations. The young people were supported to plan a community outreach event whereby they would raise awareness for the Foundation and the Bowel Cancer Screening programme with the added bonus of being able to raise money for the Foundation. Pitching up at Morrison’s Hatch End and Sainsbury’s in South Harrow, the groups set about packing bags for customers, chatting to them about St Mark’s Hospital Foundation and handing out leaflets for the Bowel Cancer Screening programme. 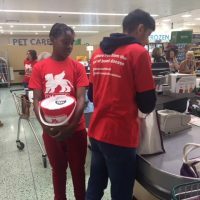 The young people received some fantastic feedback with customers commending them for giving up their time for such a worthy cause and staff at the supermarkets praised them for their care and attention when interacting with their customers. In total, the NCS teams raised over £1,400 with further funds still to come from further fundraising and awareness events that they have organised. Thank you to the fabulous young people who took part and we look forward to working with the NCS team again next year! Want to organise your own fundraising or awareness event? Let us know, we would love to help! Contact kapil.pala@nhs.net or call 0208 869 2371.